Having being given a Kindle for Christmas last year, it's been a while since I picked up an actual, tangible book, and although I find the Kindle really useful for travelling, sometimes you can't beat good old-fashioned paper books. There's something so homely about that new book smell, and sometimes it's nice to be able to bend the book to fit your hands (sorry to those of you who like to keep your books in good-as-new condition - there's nothing I like more than a book that looks a little worn but very loved) or easily flip between chapters to recap on who's who and what's what. So, after arriving early into the city before work one day, I popped into Waterstones with the hopes of satisfying my yearning for a paperback or two. And two it was. I'm not sure if it's still on, but at the time Waterstones were running a 'buy one get one half price' offer on a wide selection of bestsellers and new releases, and I found it harder than I'd like to admit to turn it down. 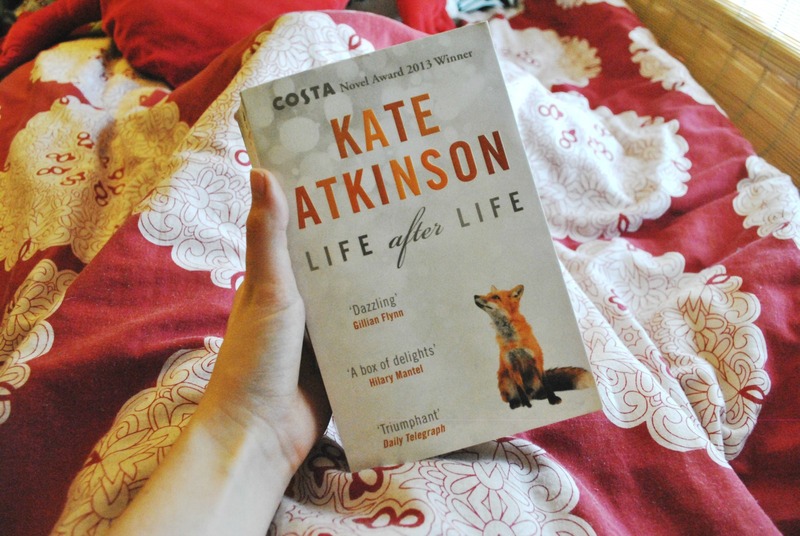 After browsing numerous shelves, swiping my fingers over various titles and reading quite a few blurbs, I settled on two books: 'Life After Life' by Kate Atkinson and 'The Goldfinch' by Donna Tartt. I decided to read Atkinson first as it was the story I was most drawn to. 'Life After Life' tells the story of Ursula, who was born in England in 1910. In the first chapter, she dies before her first breath. In the second chapter, we're taken back to that same day in 1910, only this time she lives a little longer. Without saying too much, this is the basic premise of the book; every chapter tells a different version of Ursula's life, and each time she lives a little longer. This had me gripped, and within a few chapters I found myself really rooting for her to survive, almost holding my breath when fatal events from previous chapters were revisited and sometimes genuinely crossing my fingers that things would pan out differently. Ursula and her family are quintessentially British and very intelligent characters - famous philosophers and novels are quoted often throughout the book - and there's something really endearing about them, and thanks to the snippets of letters between characters and flashbacks of Ursula's memories interspersed throughout, you really do get a sense of the stories and relationships between characters and come feel you know them quite intimately. Although it's quite a long book, it's not an intimidating one at all - there were definitely some words I had to look up (not that I mind - I'm always open to expanding my vocabulary), but the story flows beautifully and Atkinson writes in a way which makes the book readable and very engaging, and it only took me about three weeks to finish. I really did love this book and wouldn't be surprised if I ended up re-reading it some time in the future. It was the first of Atkinson's novels that I'd read but I am definitely open to suggestions from anyone who's read any of her others. If you've ever read this book or any similar ones, feel free to comment and let me know.